I've put j9K's 4quadmult module in here because it fits to the Ringmodulation module. Available on Ben Walker's Modular Corner website. two microdelays with separate tuning, damp, volume, and invert settings. delaytime of the first delay and overall damping can be modulated. good for karplusStrong or drone sounds. if inB exceed a given threshold, it is sent to the output. used to limit the change in a signal. similiar to QuadSubOctave, but w/ two inputs and [Mod] controls and inputs to modulate the gain of the four octaves. processed audio can be slightly to heavily deformed, depending on Frq, Amt, and DryWet settings. 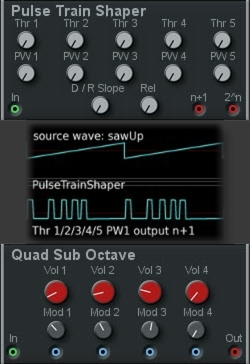 audio shaper for three input sources. 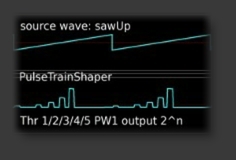 input signal level is constantly tracked and separated into five threshold zones, each turned into a pulsewave-like waveform, with individual pulsewidth settings. Slope control; Rel control for smoothing. heavy distortion of the incoming signal.